For the 24 hours to 23:00 GMT, the AUD declined 0.15% against the USD and closed at 0.7098. LME Copper prices declined 1.6% or $102.0/MT to $6147.0/MT. Aluminium prices rose 0.5% or $10.5/MT to $2007.5/MT. In the Asian session, at GMT0300, the pair is trading at 0.7109, with the AUD trading 0.15% higher against the USD from yesterday’s close. Elsewhere in China, Australia’s largest trading partner, the nation’s gross domestic product (GDP) advanced 6.5% in 3Q 2018, lower than market expectations for a rise of 6.6%. The GDP had registered a gain of 6.7% in the prior quarter. Moreover, China’s industrial production climbed 5.8% on an annual basis, falling short of market anticipation for an advance of 6.0%. In the previous month, industrial production had risen by 6.1%. Also, the nation’s retail sales (YTD) surged 9.3% on a yearly basis in September, at par with market consensus. In the preceding month, retail sales (YTD) had registered a similar rise. 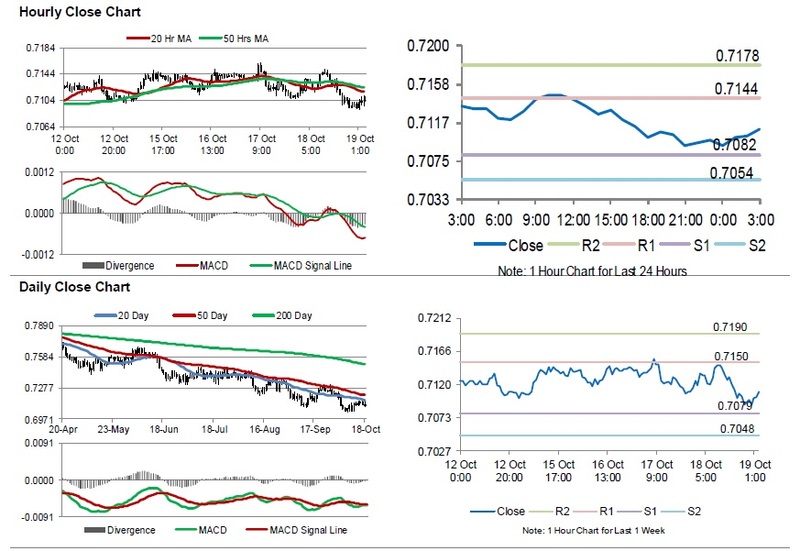 The pair is expected to find support at 0.7082, and a fall through could take it to the next support level of 0.7054. The pair is expected to find its first resistance at 0.7144, and a rise through could take it to the next resistance level of 0.7178.